home equity loans that total more than 80% of a home’s appraised value. I linked approvingly, but suggested that Texas’s rule against prepayment penalties, negative amortization mortgages, and balloon payments had actually been more important. As it turns out, I was wrong. In a followup, Katz explained that although Texas does indeed have these rules, they only apply to “high cost” loans — which means only loans that are less than $200,000 and have sky-high interest rates. Virtually no loans qualify under that standard, which means the rules against prepayment penalties and so forth were mostly meaningless. So what’s really going on? The restriction on HELOCs certainly helps explain why Texas had a lower delinquency rate than most of the country after the housing bubble burst. One of the sources of delinquency, after all, came from people who used their homes as ATM machines, figuring they could always refinance before the bills came due. When home prices started to fall, that option was closed and they were left with a ton of debt they couldn’t pay off. But although the HELOC rule explains Texas’s lower delinquency rate after the bubble imploded, the really mysterious thing is that Texas somehow escaped the housing bubble in the first place. Why did housing prices in places like Dallas stay relatively sane even while prices in similar cities like Phoenix and Las Vegas were heading to the moon? HELOC restrictions don’t really explain that. Via email, Katz pointed me to a paper by Anil Kumar, an economist at the Dallas Fed, that added some data — and some more mystery — to the picture. On average, Texas subprime borrowers have more equity in their homes than those in other states, providing larger cushions against default. 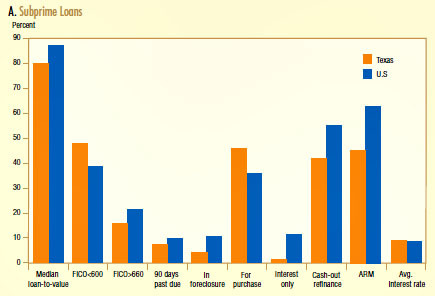 The state relies less on exotic mortgages, such as interest-only or negative-amortization loans. Texans with subprime loans are also less likely to take out adjustable rate mortgages (ARMs), which are subject to sharply higher monthly payments when interest rates reset. But why? Why did Texas largely avoid the “exotic mortgages” that fueled the subprime boom in the rest of the country? Why did Texas subprime borrowers — who were, on average, poorer than than rest of the country and had lower FICOs — apparently make bigger down payments? 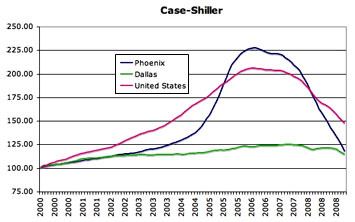 So does this explain how Texas avoided the housing bubble? There’s no way to say for sure, but I’m skeptical. Can a 12-day waiting period really be enough to put the kibosh on exotic mortgages? It doesn’t seem like enough — and anyway, my guess is that it was the bubble that drove the growth of exotic mortgages, not the other way around. So we’re still left with a question: why didn’t the housing boom ever take hold in Texas even though it seems to have all the usual sunbelt characteristics that drove the bubble in places like California, Arizona, Nevada, and Florida? It’s still a bit of a mystery. UPDATE: A possible answer here. Texas might not be the mystery at all. Maybe Phoenix and Las Vegas are.